There are a number of repeat signs used in modern day sheet music along with first and second endings, capos and codas. If you were to write the music notation for a particular song without the use of these symbols, you could end up with pages and pages of music manuscript. Most forms of modern music incorporate a certain amount of repetition, so to save on repeating the same thing over and over, we use a number of symbols which tell us what to repeat and in what order... and it saves on time and paper. Example: ||: 1 | 2 | 3 | 4 :|| Play bars 1 - 4 and then repeat them again. The first time through, you play the first ending marked 1. Then you go back to the beginning. The second time through, you play the second ending marked 2 - omitting the first ending. The first and second time through, you play the first ending marked 1.2. Then you go back to the beginning. The third time through, you play the third ending marked 3 - omitting the first and second ending. Play Bars 1 - 11 then go back to the start of bar 5. Play from bar 5 to bar 10, this time omitting bar 11 and playing bar 12 instead. Da Capo means 'from the head'. It is often abbreviated as D.C. It means you go back to the beginning of the music. Dal Segno means 'from the sign'. It is often abbreviated as D.S. It means you go back to the sign instead of going back to the beginning of the music. Al Coda means 'to the tail'. It means that you must go to the end section that starts with the coda sign. Play Bars 1 to 12 - when you reach D.S. al coda (Dal Segno al coda), go back to the coda sign at the beginning of Bar 1... the coda sign can be anywhere in the piece - it just happens to be at the first bar in this example. Play Bars 1 to 8 - when you reach al coda, go to the coda sign at the start of bar 13. 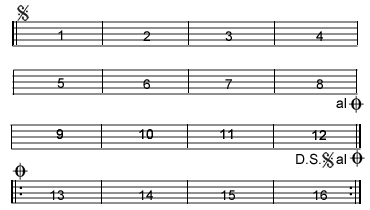 Play bars 13 to 16 and repeat them again.